After two albums (Just Breathe and White Lies) and national tours with acts such as Chiodos, Scary Kids Scaring Kids and Funeral for a Friend, LoveHateHero is back with a new album. America Underwater will be released on Tuesday, September 29th on Ferret Music. Be sure to check out the video for the title track here. I had the chance to talk to singer, Pierrick Berube about the evolution of the band, catching fans off-guard with a revamped sound and the future of their music. Enjoy! How do you think LoveHateHero has evolved since the last two albums, Just Breathe and White Lies? Well, we’ve become better musicians, better singers, better songwriters, better composers. Better everything over time. Do you guys think that you’ve reinvented yourselves with this new album at all? I guess you could call it that. I mean, it just kinda happens. Our influences change every few years so. Like, we didn’t purposely reinvent ourselves. We were just excited to write complete, full songs with a message and not really worry about showing off. So does this new album have the same edgy sound that people tend to expect from LoveHateHero or did you incorporate anything new? What area(s) do you guys think you’ve improved the most on since the last album? Would you guys say that you’re the same band you were in 2008 or is this new album going to catch fans off-guard a little? I’m sure it will catch a few people off-guard, definitely. [Laughs] It’s not the same at all. It’s definitely evolved to something completely new. Will there be a good amount of touring for this new album? Yeah, we hope so! We’ve got a few tours booked and we’re going out of the country a couple times. Hopefully we can tour the whole year. What songs are you the most proud of and why? I’m very proud of a lot of the songs. Some of them I kinda stepped outside of my own boundaries and write songs that I’d never even tried to write before. There’s a song on our record called “Wait and See” which is very U2. I was really proud of writing that songs because it’s not easy. It wasn’t easy for me at all to write that song. What have been some of the crowd favorites in terms of songs? Did you guys play a lot of the material that’s going to be on your new album when you were out on tour this summer? Yeah, we’ve been playing 2-3 new songs for the past couple months to promote the new album. Once the record comes out, we’ll probably start playing probably half new songs and half new songs. How’s the crowd receiving the new stuff so far? It’s seems like they like it. I mean, it’s a little different because most of them haven’t heard it yet so half the time, with our old songs, everyone’s singing along going crazy and then they hear the new songs and they don’t really know them so they’re just kinda banging their heads. 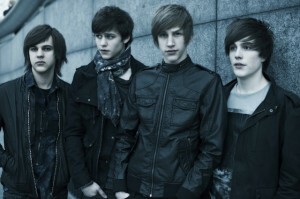 What can we expect from LoveHateHero in 2010? Lots of touring. I believe we’re going to the UK. Just keep promoting the new album. Keep doing it, keep pushing it. That about wraps it up! Anything else to add? Make sure to check out our new album, America Underwater! LoveHateHero has dropped off the Gwen Stacy tour that was to kick off next month. The band will now be joining Eyes Set To Kill, and Dreaming of Eden on a fall tour beginning 10/23 in Orland Park , IL . An 11-city Brazilian tour will follow. Be sure to check their myspace for all the dates! Orange County, CA – Arising from the sweltering heat that has been burning down Los Angeles, one band seems to have the antidote. ENTICE, an Orange County based quartet has been turning heads with their appropriately titled album LET THE FIRE COME. The tracks carry over a relief of heavy, yet tranquil melodies that set the tone for a variety of publics to enjoy. Recorded at Orange Crush Studio with producer Scott Silletta, LET THE FIRE COME exasperates the efforts of the hard working band and reaches a level of professionalism that promises to astonish even the toughest critics. The self-proclaimed singles “The Watchman” and “Who’s Got Your Money” have gained Entice a spot amongst the Alternative and Active Rock-Pop genres. The songs carry through mature lyrics and notions that fall above love, lust and heartbreak. There is no question about these guys gaining support to potentially fit in with various radio formats. With every track out-doing the next, LET THE FIRE COME holds its weight in gold, yet Entice truly is all about the music. In accordance with the album release, all eleven songs are available for review via MySpace. LET THE FIRE COME is a spot-on reflection of the goals Entice have set for themselves as performers. LET THE FIRE COME is available for review and purchase through ITUNES and will be available through other online outlets on 09/22/2009. In accordance with the release, the band will unveil a new Myspace and live v ideo on 9/22/09 as well. New album, new live video and new Myspace STILL not enough? It’s been forever since we’ve heard anything from The Used. These guys are all set to make a triumphant return to your eardrums on August 31st. Get ready! Their new album, Artwork is sure to deliver. Can’t wait a few more days? Well, you can stream their new album right now…before it even hits stores. Just head on over to their myspace page. In the meantime, check out my interview with drummer, Dan Whitesides. The Used has been through a lot of changes recently ““ you’ve come in as the new drummer, there’s been some management changes, etc. How’s the overall vibe of the band these days? Feelin’ good? Absolutely. I think we’re stronger than ever and that’s one of the main things that’s been so rad. We’re better friends now than ever and definitely stronger than ever in so many different ways, know what I mean? We’ve taken over our careers basically and everything that we do is all us. Like, with the firing of the management and the new producer and all that ““ we decided we wanted to take it all in our own hands and take it a little more seriously but also have fun in the process and that’s what we’re doing. The Used’s new album, Artwork drops on August 31st. How would you sum it up? Is there a theme to it or is just a mix of everything? I don’t think there’s a theme, but I do think that The Used is one of the most honest bands out there and I think that lyrically especially, Burt writes about things that happen in his life or just personal things…so every song definitely has that vibe to it. The cool thing about Artwork is that every song is different from the one before, but it all ties in together so well. You know, I listen to this album almost everyday”¦which is weird for me to listen to something I’ve recorded because I never do that. But, the album is a mixture of everything. It’s soft, it’s beautiful, it’s dirty, it’s poppy. I think The Used’s music has always been a little ahead of the curve. Speaking of The Used’s music, it’s been a good amount of time since we’ve heard anything from the band. Why did you guys choose “Blood On My Hands” as the first song for fans to hear after all this time? We just wanted to come out and blow the doors open. Like, here we are again! I think that’s the perfect song to do it to. There was no question on what it was going to be with anyone. As a band, we all decided, “Okay, we all wanna come out with ‘Blood On My Hands’ because it’s a pretty pissed song, it’s in your face, it’s heavy.” Everybody at the label agreed and said let’s do it. I think we made the right decision and it’s going over well. How can Artwork be compared to the other albums from The Used? Talking to everybody, I know there hasn’t been this much excitement about an album since the first self-titled album. I think we were really prepared when we were writing this album. Going into this studio, we were done writing pretty much…we just had to put some finishing touches on everything. With Lies for the Liars and In Love and Death, those were both written in the studio and they were kinda”¦well, not forced”¦because In Love and Death is one of my favorite albums. I think The Used Can write under any situation. This album in particular, the excitement around it and just wanting to do it and do it our way”¦that’s what it is. The Used has always worked with producer John Feldmann in the past. This time, you guys worked with Matt Squire. What was it like? Matt’s just laid back. The first time I met him he was wearing flip-flops, feet kicked up on the couch. Then we got to talking and the cool thing is that he’s from the DC area and kinda grew up playing with or in bands I was listening to when I was younger so I was excited about that. The main thing is, like I said, we went into the studio with this album almost done so we told Matt what we wanted and he just kinda facilitated that. I don’t know if he’d say the same thing, but I think it’s one of the easiest records he’s ever had to do. We were absolutely prepared and knew what we wanted. Would you consider this album to be more mainstream than the previous albums? I think it is whatever anyone wants to make it. To me, it takes me back to the first two records. I wouldn’t call The Used an underground band, but I wouldn’t call them Metallica either. The Used has always kinda been right in the middle. Whichever way it goes is fine with me. We wrote a record that we love and it takes me back to the beginning of the band for sure. Yeah, we wanted to do something special for the fans. We’re doing a lot of that with this record. We’re having a Twitter release party. We’re constantly doing things for the fans so that’s the reason we did it, really. We wanna go and play small and more intimate shows. Seeing the fans on that level is way better than seeing someone in like a stadium or something like that. It sounds a lot better and the vibe is a lot cooler. We’re just trying to give things back to the fans and it makes things fun for us, too. It mixes things up so it’s good. If you dig us, come see us play. We’re going to be on tour a lot this year. Check out our tour dates! Need Something New To Listen To? Check out the band Entice! You can listen to their album right here. If you’re in the Southern California area, be sure to catch these guys at Chain Reaction with The Ataris on September 25th. You can buy your tickets here. Platinum-certified Reprise Records artists The Used have announced a nationwide headlining fall tour. The month-long run, which kicks off October 9th in Las Vegas , NV and runs through November 14th in Portland , Oregon , will support their new album, Artwork, out August 31, 2009. The Almost and TK will be supporting. The Used’s legions of fans are responding as well. The first single, “Blood On My Hands” premiered on iTunes with over 5k downloads in the first day, the highest digital debut in the band’s history. The video for the song debuted on MySpace and shot directly to the #1 spot, with 200,00 views in the first 24 hours. The band is one of MySpace’s Top 15 artists, with over 100,000 streams a day on the site. The second track to premiere on iTunes will be “Born To Quit.” It will be released on August 11th. The Used headlining tour dates are as follows. Venue and pre-sale information will be announced soon. First thing’s first. Name and position in the band, please? Tommy and I’m the singer. You guys have said that you’re doing your own thing and you’re veering away from having the same style as everyone else. Describe “your sound” and what makes you different from other bands on the scene today. One thing that we have kept which you don’t often find with bands who come from England surprisingly is the English accent. We have veered away from the indie scene and are a safe distance away from the emo scene landing us with some sort of rock/pop/alternative sound which we believe is quite unique. If you like The Beatles, The Red Hot Chili Peppers and Franz Ferdinand, you’ll probably dig us too. If you had the chance to pick your dream lineup of bands that you think would be complimentary to your sound to tour with, what bands and why? It would be incredible to gig with the likes of Elbow, Kasabian, Franz Ferdinand and Of Montreal. whether we would complement each other’s sound is debatable, but audiences these days like a bit of variety. What is your overall goal as a band at this exact moment? What are you focusing on? At the moment, we’re working on making our first album as good as it can be. We’re looking over old songs and adding ideas which, now that we’ve all developed together, are really making an impact on our earlier material. What can we expect from your upcoming album? Where can listeners in the US go to hear more from you guys? www.myspace.com/frankoUK We have 6 tracks up at the moment and there is talk about putting our newest recordings up soon. We can’t wait to go to New York! Helena, MT based band, Goodnight Sunrise is on a roll lately. These guys have been touring relentlessly — they have a tour history listed on their Myspace and it’s enough to make a grown man cry. Somewhere amidst the tours, Goodnight Sunrise released their EP, Stop Drop and Roll. In addition to picking up the EP (which I highly recommend), you should catch them on the “Pop, Drop and Lock It” tour. Check out this interview! Name and your position in the band? Hey I’m Dan, and I sing and play guitar for Goodnight Sunrise. You guys have a DIY approach to the music business. Is this your own doing or are you actively label shopping? We’ve been label shopping, but right now we’re happy touring and making music on our own. Until the right offer comes up, it’s smarter for us to tour on our own and keep a majority of the money we make on the road and online. Is it important to you to remain true to your music and do your own thing? Or would you rather be a little controlled by a label if it meant having that helping hand? Of course it’s important to stay true to your music. Having a label control different parts of the band like booking, publishing, & merch can have it’s ups and downs. It can save us work and help the band grow, but at the same time our income will be divided up with a lot of different people. A lot of people don’t realize that a majority of every penny a label spends is recoupable. You’ve played over 250 shows and shared the stage with some great bands since the release of your debut EP. What’s been the most memorable show to play or band to play with? We played with Anberlin in Montana recently. That was a pretty cool thing for me because I was a pretty big Anberlin fan throughout high school. Playing historic venues like The Roxy and The Whisky in LA were also very memorable shows. You’re embarking on a national tour in July. What are your hopes for that tour? How is touring as a DIY band? This will be our first national tour. We’ve toured the West Coast repeatedly since June 2007, so we can’t wait to branch out and hit some regions we haven’t played before. Touring as a DIY band is hard work, but in the end it works out if you can fill the dates and make contacts in regions where you want to spread your music. Crunk Energy drink is one of your sponsors. Does this mean fans can expect an energetic live show? What else can they expect? Haha, I guess the Crunk could contribute to some of our energy on stage. All 3 bands on this tour will be wired from energy drinks. We’re playing a lot of new material this tour, so if you’ve seen us in the past expect new songs and merch! We’ll also be doing contests at our shows giving away more clothing from some of our sponsors. Has having songs on MTV’s “Real World Road Rules Challenge,” “Bad Girls Club,” and “Keeping Up With The Kardashians” created a lot of buzz for you guys? What advice do you have for other bands who want to stay on the DIY route and achieve the success that you guys have? Just stay persistent and continue playing shows to build a fanbase in your region. DIY touring seems impossible at first, and we were in a position where we felt it might have been at one point. Just work hard and don’t get impatient when venues and promoters don’t respond right away. Your first few tours may be depressing and stressful at times, but it really can get easier with every tour. Check the band’s Myspace page for all their tour dates! You can also buy their new album either on iTunes or here. The Dangerous Summer is one of those bands who have perfected the art of touring and it shows. They’ve been touring heavily lately to promote the release of their new album, Reach for the Sun. I took a well-needed break from the heat, pits and madness of Warped Tour to catch them on their BBQ America Tour with Ace Enders. These guys are a treat to see — especially in such an intimate venue like the Knitting Factory in Hollywood. When the crowd was asked how many had heard them before, only about half raised their hands. I can safely say, The Dangerous Summer probably gained a huge following last night. Your newest album, Reach for the Sun has been out since May. How’s it feeling so far? It’s awesome. We’ve gotten a good response from all the kids and stuff like that and all the reviewers have been treating it well. We’re just real happy with it. Reach the Sun is really autobiographical, does that make the release of it even more tense in how the audience receives it and how it gets reviewed since it’s pretty much you putting your diary on the line? I mean, like, it’s like, kinda crazy putting myself out there that much. All the kids have been taking it well, they’ve been like, “that really relates to my life.” They’ve found pieces of it that really pulled parts of their lives together. It just feels good. I just put as many honest things as I could down and people seem to be treating it rather well. Other than it being super autobiographical, how does Reach for the Sun compare to your other work? I think we really grew up a lot. We wrote If You Could Only Keep Me Alive when we were seniors in high school. Now we’re two years out of high school and touring. We didn’t even tour on the EP. While you were in high school, you were working with a producer who has worked with All Time Low, Dashboard Confessional, etc. How did that feel? It’s awesome, I mean, when we were in 9th grade of high school we were working with him. He’s like, the local big guy. We became really, really close with him and it just became natural to work with him. It wasn’t even like going out to do an album — it was like hanging out, writing some songs while you’re at it. So, you have a new album out and you’re touring right now. What’s after that? Lots of bands are out on Warped Tour right now. Do you consider The Dangerous Summer to be a potential Warped Tour band? Is that something you guys eventually want to do? Oh yeah, we eventually want to do the whole Warped Tour stint but this year we got the Ace Enders tour and we just couldn’t pass it up. So many good bands, it’s like legends that we grew up with. We’re just so happy to be on this tour. Not looking past that, really. Do you guys have any friends on Warped Tour right now? Not too many ““ but All Time Low‘s joining up eventually, they’re going to be off having fun. Can you believe they just played three shows, in three different times zones in the same day? Yeah, that’s intense. I heard it went off without a hitch, too. That’s awesome. Who do you see as the next big thing in music right now? There’s this band, Paper Route we really like. They’re AMAZING. I think they’re going to be like, Coldplay status. They’re good, definitely check them out. They’re going on tour with Paramore this fall. Check out the new album if you haven’t already! Time and Distance currently have their new album up on AOL music’s Full CD Listening Party. You can stream their new album, Gravity through July 12th right here. Their new album Nothing Personal is in stores now, too!